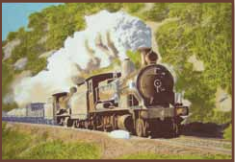 The Steam Train is pre-shaded on non-woven measuring 23 x 34cm. Using colours: 1, 12, 14, 23, 76, 84. Use a blotters sheet underneath whilst painting.